Maybe the Big 12 had it right, at least until this year…no conference championship game. Why play them? Is a conference title more important than a national title? Let’s ask Auburn. Let’s ask Wisconsin. Let’s ask 2016 Penn State. The College Football Playoff Committee announced the final four today including ACC Champion Clemson, Big 12 Champion Oklahoma, SEC Champion Georgia and the team that had a bye week during Championship Saturday Alabama. This is nothing against Alabama. The Crimson Tide went 11-1 and they’re the biggest game of every team’s schedule. They take the opposition’s best shot every Saturday. They didn’t even win their division in the SEC though. They couldn’t qualify for the SEC Championship but did for the National Championship? That’s just crazy to me. How can a team that doesn’t earn a trip to its’ conference championship game deserve a shot at the national championship? I’ve spent all day thinking about how the committee did this two years in a row. They put a team that can’t qualify for a conference championship in the College Football Playoff. My biggest beef isn’t over who’s #4. It’s that teams are playing meaningless conference championship games. How many of you Auburn fans would rather have a SEC title instead of a national title? How about you Wisconsin fans? Each team should be playing for a national title but instead they had to play a top team for a conference championship and lost costing them a spot in the playoff. The NCAA should end conference championship games and expand the college football playoff to eight teams. So how does this new eight team college football playoff work? Well let’s get to that in my redesign for college football in The New 8 Team College Football Playoff. 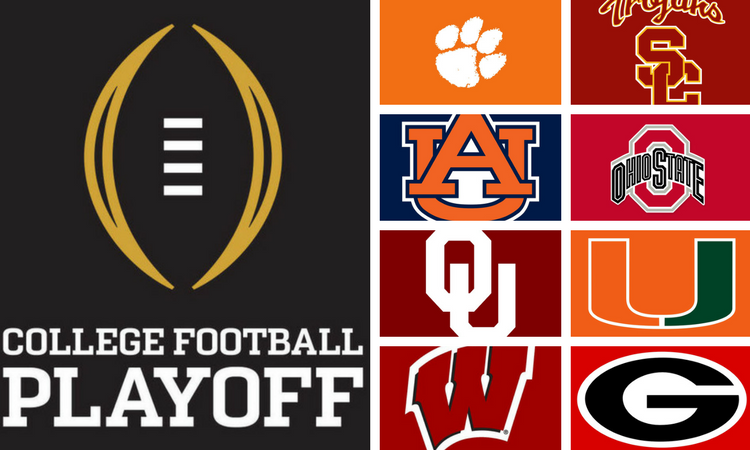 Instead of debating who should have been number four in this year’s College Football Playoff, we add a round to the college football playoff. First let’s get this out of the way. The College Football Playoff is for the Power 5. The group of 5 is never going to have a team in the playoff. NEVER. If you think there was outrage over Alabama getting in today or Ohio State last year, imagine if Central Florida would have been fourth today? There would have been riots in Tuscaloosa and Columbus. There are 9 Power 5 divisions. Only the 9 division champions earn consideration for the 8 team College Football Playoff. Sorry Notre Dame, you’re going to have to join a conference for football or sit the playoff out every year. Same goes for you other independents. I’d anticipate as soon as this change would be announced, the Big 12 would expand back to 12 teams and split back into two divisions so the committee would more than likely by choosing eight teams from a pool of 10 teams. The Big 12 would gladly scoop up Notre Dame and BYU. The College Football Playoff Committee just needs to worry about ranking teams. They don’t need to choose. All they would have to do is rank the division champions 1-9 and know #9 is chopped off the list. Then it’s 1 vs. 8, 2 vs. 7, 3 vs. 6 and 4 vs. 5. This year Stanford would have been 9th and left out of the playoff. How many people would argue about that? We have a new playoff. The first Saturday of December would become the first round of the playoff. The quarterfinals would be scattered across the country at sites that had previously hosted conference championship games. Here’s how I’d envision round 1 of this year’s playoff looking based upon the College Football Playoff Rankings prior to conference championships. The semi-finals and national championship game would stay on schedule for January 1 and January 8, 2018. The new 8 team playoff would simply college football by knowing what it takes to earn a playoff spot. You know you have to win your division to be considered. With the change to the playoff, scheduling would get better. With knowing you need to win your division to be considered, teams can step up the non-conference scheduling to improve their ranking come playoff time. Gone will be the days of scheduling FCS teams and we’ll have more heavyweight battles. Like we see in college basketball, college football can adopt the Big Ten vs. ACC Challenge. We’ll see conferences spend a Saturday watching conferences battle it out for supremacy knowing that could be the difference come ranking time at the end of the season. Let’s stop making teams like Auburn beat a good team Georgia twice in a month to make the College Football Playoff. Imagine if the Iron Bowl wasn’t just for a spot in the SEC Championship game but virtually guaranteed the winner a spot on the road to the national championship? Tell teams what it’s going to take and stop wasting time on conference championship games that are irrelevant as far as winning a national championship.